Oh, my, only one week left in June! I'd better get to work on my June UFO. Conveniently, this project also uses up a pile of my 3.5" scraps. The quilt is "Country Sunshine," from a 2002 edition of "Quilting Ideas" magazine. It requires 20 blocks, and 104 half-square triangles for the border. 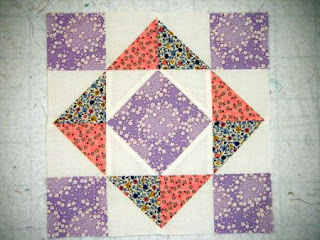 Thank you, Bonnie Hunter, for the idea to use the cut-offs from magic corners to make bonus HSTs. I already have more than half of them made! Linking up to Kim's Big Quilting Adventure, Scrap Basket Sunday. I'm missing out on Brown Bag Surprise today to finish up the "Heart of Colorado Shop Hop." Come back next Saturday for a full report, on Saturday Stash! Pretty block. I like the fabric choices in this block. There sure are a few HST in tht block - very soft colours. Sew On!! I love the combination of fabric colors! I really like the purple! I love the colors you chose. The block is so pretty. I think I have all the issues to Quilting Ideas. I will have to look that one up! Nice block... so clever to have the bonus HST from your other project! Very pretty block - so romantic looking. I can't wait to see the whole quilt. Have a super day!